Welcome To Monkey World! is a level in Super Mario World 2: Yoshi's Island and its Game Boy Advance remake Yoshi's Island: Super Mario Advance 3. It is the first level of World 3. The level starts out with a Yoshi next to a sign. Yoshi must Ground Pound the dirt, and by smashing the pole all the way down, a cloud is revealed; if this cloud is hit by an egg, many stars will pop out. The player must then go to the log; if the player destroys the next cloud, a flower appears. 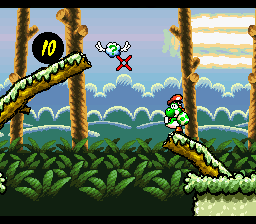 Yoshi then comes across another pole (from which a red coin is revealed once ground-pounded completely). The player can destroy the clouds to reveal some stars. After a while, the player can move on to the next area. The player will emerge into a mud-filled area. The player will encounter a few monkeys, but will eventually find the Middle Ring. By going down a hill, the player will reach some poles, and will soon thereafter reach an Egg Block. Yet another cloud containing stars will appear, followed by a platform. The player will be able to move on to the next part of the level after a little while. A red coin can be revealed by ground-pounding the pole. A swing of monkeys will appear trying to block the player's way; once the player passes this obstacle, the Yoshi can continue on its journey. After a few more obstacles, the end of the level will arrive. Spanish ¡Bienvenido al mundo simio! Welcome to the ape world! Italian Nel mondo delle scimmie! In the monkey world! Huānyíng lái dào hóu shān! Welcome to Monkey Mountain! This page was last edited on July 28, 2018, at 13:51.